I had been interested in history and archaeology for over forty years and when I saw the Flodden 500 advertisement in the Berwickshire News, looking for volunteers to help on a dig at Ladykirk, I was surprised and pleased. I wrote to Chris Burgess immediately saying I had no experience but would like to help if I could. Chris’s response came later that day, not only saying I was welcome to join the dig but also going so far as to add Health and Safety instructions and a map of how to get there! I couldn’t believe how easy it had been to get involved. Nor could I ever have imagined where that letter would lead me. I arrived at Ladykirk on a cold and windy day expecting to be asked to make tea or carry buckets for the diggers. Within half an hour of the Health and Safety talk I was swinging a mattock (carefully) into the hardest piece of turf I had ever come across. Later that day, when the turf was off, a kindly archaeologist named Lizzie showed me how to trowel and suddenly I was actually digging. I didn’t find anything other than stones and gravel and I’ve never found anything of world shattering importance to this day but I loved it from that very first morning and I’ve never looked back. Over the years I have been part of many associations, clubs etc. but I can truly say I have never known a more inclusive and welcoming group of people than those who do archaeology. It never matters how simple the question you ask or how many times things have to be repeated, archaeologists and volunteers alike are patience itself and always ready to share knowledge. Who knows, perhaps later over a drink or cup of tea they shake their heads in disbelief or dismay but that never communicates to us volunteers, we are always supported and helped with great good humour. There has been so much to learn and so much terminology to remember and I don’t think the learning curve will ever stop rising. 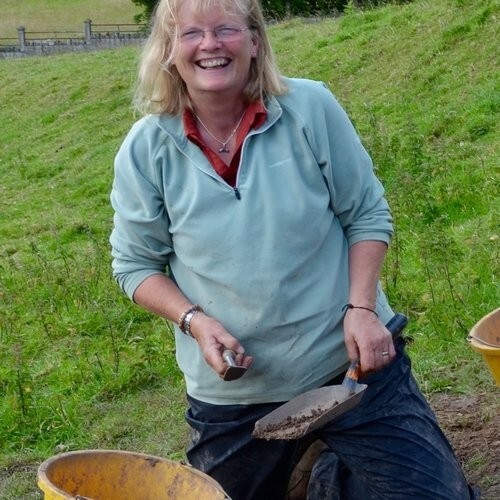 Chris set up many training opportunities and lectures and encouraged us to try and learn all kinds of new skills from metal detecting to identifying pottery and from measuring out trenches to drawing sections. There have been opportunities to work with, and learn from experts in their field such as John and Jenny and of course benefit from listening to all the discussion and speculation that surrounds every discovery! We are repeatedly helped and reminded how to use any new skills and doing so has been a very important part of the project. Chris’s ‘can do’ attitude inspired confidence and gave everyone a lot of laughs on the way. This confidence has enabled me to join many other digs with other archaeology groups and again, I have met with nothing but support and encouragement. There has been the opportunity to meet with like minded people from a wide area and this in turn has led to many other avenues of interest. One particularly important opportunity was the chance to become a volunteer with the Young Archaeologists Club (YAC). Before I was asked to take part by Jane Miller, who started Flodden YAC, I had never even heard of such a group. I have since met with some very interested and hard working young people who meet regularly to learn and to take part in activities and digs. The children seem to enjoy the sessions very much and there is evidence to suggest that being part of YAC is helping to guide some of the members in their career choices. Being part of TillVAS, and speaking to other volunteers and professionals, I have become aware that there are many, many other groups who run training courses, lectures, activities, research etc. The list is endless and the problem is being selective. It just takes one toe in the water for the ripples to spread. For me Flodden 500 has opened countless doors in so many directions. I’ve got to know people I might never otherwise have met, I’ve learned to do something I never even imagined was possible, I’ve seen some beautiful areas of the country I would never have known to visit and lastly, I’ve had a lot of good old fashioned fun and enjoyment. I think that’s quite a legacy for Flodden 500 to leave.